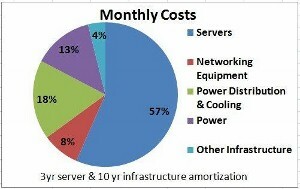 A couple of years ago, I did a detailed look at where the costs are in a modern , high-scale data center. The primary motivation behind bringing all the costs together was to understand where the problems are and find those easiest to address. Predictably, when I first brought these numbers together, a few data points just leapt off the page: 1) at scale, servers dominate overall costs, and 2) mechanical system cost and power consumption seems unreasonably high. Both of these areas have proven to be important technology areas to focus upon and there has been considerable industry-wide innovation particularly in cooling efficiency over the last couple of years. I posted the original model at the Cost of Power in Large-Scale Data Centers. One of the reasons I posted it was to debunk the often repeated phrase “power is the dominate cost in a large-scale data center”. Servers dominate with mechanical systems and power distribution close behind. It turns out that power is incredibly important but it’s not the utility kWh charge that makes power important. It’s the cost of the power distribution equipment required to consume power and the cost of the mechanical systems that take the heat away once the power is consumed. I referred to this as fully burdened power. This post supports one of the ideas I threw out there on Amazon's financial discipline. At many companies the rigors of getting approval a data center construction project approved are from the business units, technical people, and the CFO. I would expect at Amazon.com, everyone wants to see the numbers, and they spend much more time on financial modeling. Should we lease or build? What is the best use of Amazon's capital and cash? What is the overall operating expense of a leased vs. owned facility? Latest decision in the East Coast. Lease. The one variable that is difficult to put into an excel document is the taxes you pay. Believe it or not the tax incentives are one of the biggest things that gets the big builders to be in one state vs. another. James's data is a good starting point, but don't forget to get your tax department involved in the data center project.